Sandra Bland autopsy: Suicide indicated thusfar rather than homicide, officials report. 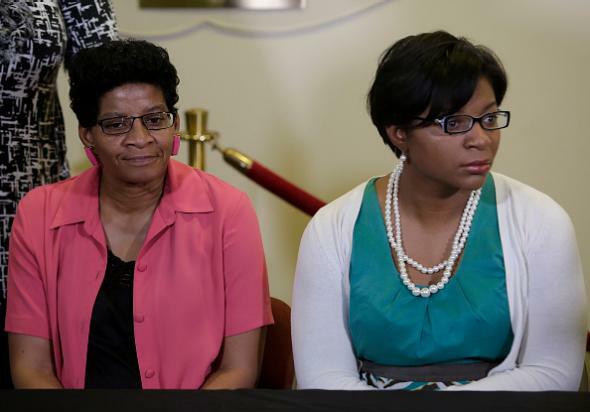 Sandra Bland’s mother and sister during a press conference at DuPage AME Church in Lisle, Illinois on Wednesday. When a person is strangled by someone else, he said, there are usually multiple signs of struggle, like petechiae, or tiny hemorrhages, in the eyes and mouth, and involuntary bite marks in the mouth, but there were none on Ms. Bland. Any object used to strangle her would have moved and slipped, causing multiple marks, but instead, there was “a uniform and consistent ligature mark around her neck,” consistent with hanging. Earlier this week the DA’s office said that investigators are looking for DNA and fingerprints on the plastic bag that was found around Bland’s neck. Further toxicology tests are also being conducted after initial tests found marijuana in her system—a finding that prosecutors say could be relevant to her state of mind at the time of her death. Bland’s family has ordered an independent autopsy, the results of which are expected to be available this week.